A 7-Storey Boutique Condominium on the Corner of Lake Shore & Long Branch Avenue Designed to be a hallmark building featuring timeless elements of traditional architecture combined with modern sensibilities design and function, this exclusive community will be located Just steps from Lake Ontario‘s waterfront. With easy access to public transit and several major highways, Watermark Condos promises to be the perfect place to call home. At Queenscorp, we are committed to develop residences to meet the needs of today’s homeowners while safeguarding the well being of future generations. In our effort to develop a greener lifestyle in our condominiums, we continuously focus on environmentally sustainable building designs by adopting initiatives when possible to reduce energy consumption. High efficiency fans, pumps, boilers, air conditioning units along with advanced low flow fixtures for toilets, washers, showers and faucets are examples of green features incorporated in Watermark Condos. Along with ample secure bicycle parking, the green roof top and recycling centre, at Watermark Long Branch you will be provided with greener, more efficient surroundings to help you do your part to make the difference. 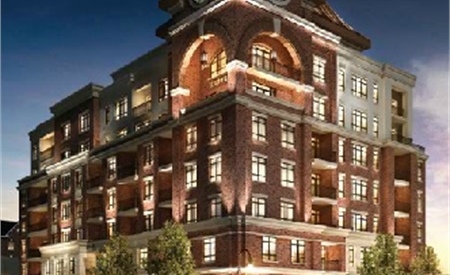 Inspired by the elegance and sophistication of Long Branch’s historic past, the features and finishes of Watermark Condos offer residents the quality and craftsmanship of a bygone era. Stunning materials, gorgeous interior layouts and spacious balconies and terraces all designed to seamlessly co-exist in one stunning lakeside landmark. Soaring 9′ foot ceiling heights throughout (excluding bulkheads). Conveniently located in-suite laundry area complete with ENERGY STAR® high efficiency, stacking front loading washer and dryer (white in colour). Stunning full height mirrored slider closet doors in foyer. Upgraded ENERGY STAR® high efficiency stainless steel appliances including 17 cubic foot frost free fridge, slide in stove and 24 inch dishwasher. Low flow, single lever kitchen faucet in chrome finish complete with pull out vegetable spray. Low flow, polished chrome single lever vanity sink faucet. Upgraded low flow, high performance toilet(s). Low flow, high pressure showerhead with pressure balance and temperature control; polished chrome tub/shower faucet. Premium quality, white bathroom fixtures throughout, including matching bathroom accessories (toilet paper holder, towel bar and soap dish). Hard wired smoke and carbon dioxide detector, in-suite sprinkler system and fire alarm including silencing switch. Separately metered hydro, and individually controlled in-suite heating and air conditioning system. All interior finishes to be selected with the assistance of a Queenscorp design consultant. * denotes availability determined by suite design, *** denotes finishes to be selected from Vendor’s samples. Price List Will Become Available Soon, Register Now and be the first to know!